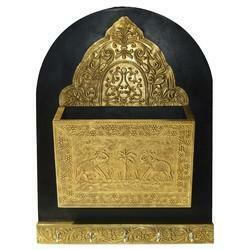 Fine Decorative Wooden Key Hanger With Brass Work Available In Different Designs & Sizes. Wall Shelf made up of engineered wood. Board Size (Inches): 24" x 36", 24" x 18", 60" x 48", 12" x 18", 23"x35", 17" x 23"
Size: 2 x 3 feet, 3 x 4 feet, 5 x 4 feet, 6 x 4 feet, 8 x 4 feet. Grey Aluminium Key Box, Board Size (Inches): 24" x 18"
Board Size (Inches): 24" x 18"
With firm commitment to quality, we are presenting for our clients a stylish range of Key Hanging Board. Beautifully crafted Chokh dhani is the specialty of our product range that we offer to our patrons Rajasthani Handicraft. This Chokhi dhani is akey holder.